Announcer #1: Welcome back! 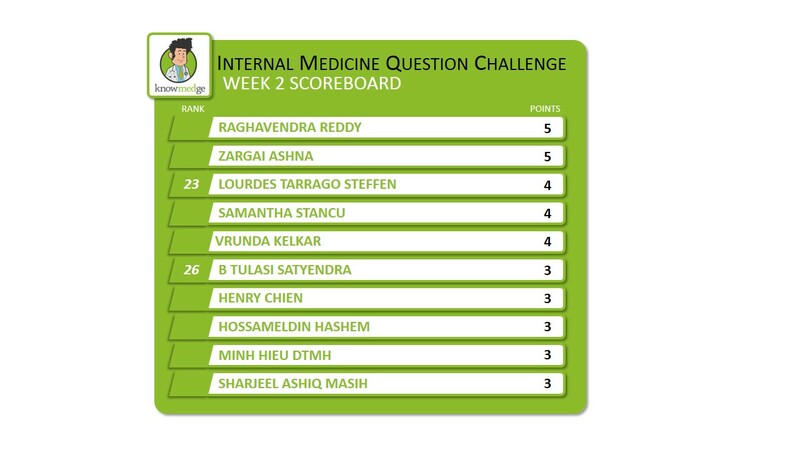 We’ve just wrapped up Week 2 of the Knowmedge Internal Medicine Question Challenge. 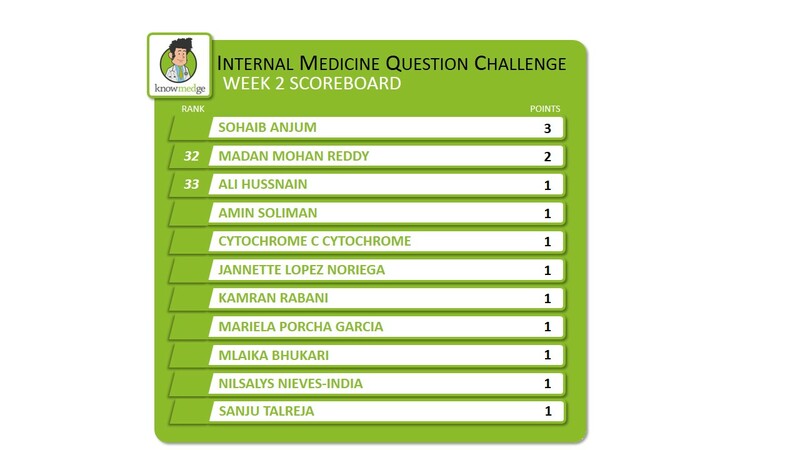 We witnessed some really impressive performances this past week as individuals hit their stride over the Nephrology portion of the competition. Announcer #2: It’s been incredible watching the field of participants demonstrate their medical knowledge and learn from their colleagues throughout the world. And it continues to be a very close race – the top 6 scorers this past week were separated by only 5 points. And just as I predicted last week, we’ve seen some impressive jumps in performance over the first two weeks of the competition. The biggest jump of the week came from Harjas Moorjani, who shook off a late start in Week 1 to earn a 2nd place finish this past week. Awesome performance, Harjas! 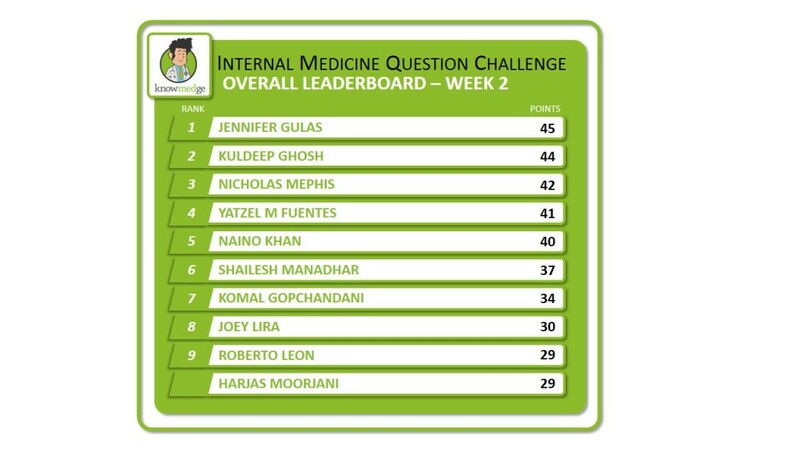 Announcer #1: And as we shift our attention to the Overall Leaderboard after two weeks of competition, we see that Jennifer Gulas translated her impressive performance during the first two weeks into the overall lead at the midway point of the competition. Great work, Jennifer! Announcer #2: Looking forward to the upcoming week, what can we expect to see? Announcer #1: Week 3 officially kicks off in a couple of hours and we’ll see the course shift to cover Neurology. 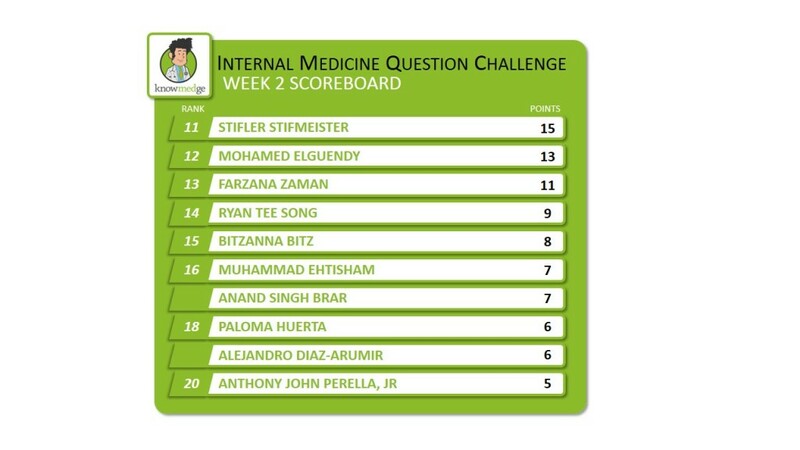 I expect to see more records being broken as participants continue to amaze us with their mastery of challenging medical topics. In addition to a prize for the top overall performance, we’ll be conducting a raffle at the end of the month to give away a 1-month subscription. Announcer #2: So everyone, including new participants, are still in contention to be awarded a prize? Announcer #1: Absolutely! 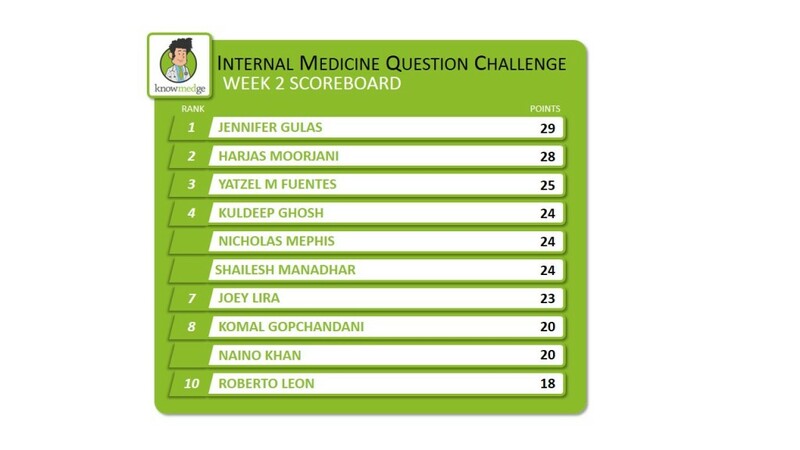 Even if you don’t end up with the highest point total at the end of the month, you could still win a subscription to the Knowmedge Internal Medicine Question Bank. The more points you’ve earned, the better your chance of winning our raffle! Announcer #2: That’s exciting news, indeed! Keep Liking and Sharing the posts to earn extra points. Check out the details of the Knowmedge Internal Medicine Question Challenge here to get started! At the end of the month, the participant with the highest overall point total will receive a free 3-month Knowmedge subscription and bragging rights! Signing off for now, tune in next week for the latest updates!